The time has come (finally)! Effective May 7, 2018, the menu-labeling regulation by the Food and Drug Administration (FDA) officially became the law of the land. This is a good thing – Find out why here. Restaurants and similar retail food establishments with 20 or more locations or a franchisee chain with 20 or more locations will be required to provide calorie counts and nutrition information on their menus and be able to provide additional nutrient facts to any customer upon request. If, So – What Information Do You Need to Provide ? The number of calories contained in a standard menu item listed on a menu or menu board. 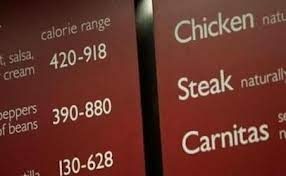 The number of calories contained in a standard menu item that is a self-serve food or food on display on a sign adjacent to the corresponding item. Additional written nutrition information upon consumer request. For more details, visit the FDA’s Labeling Guide for Restaurants and Retail Establishments. You may want to print a copy for reference. Still have questions? We’re here to help! Feel free to email or call us at 505-343-9848.